AquaBlade long scrapers feature solid fiberglass handles. Instead of using glues that break-down like other scrapers the AquaBlade handles are v-grooved from the side and inserted into the head of the scraper during the injection molding process. Under thousands of pounds of pressure the handle is fused to the head becoming a part of the molded piece. By utilizing virgin plastic in the molding process instead of re-grind or recycled plastics, the AquaBlade is much stronger and more agile than other scrapers. The first time you pick up an AquaBlade youll notice the difference it makes. It feels strong and durable perfect for White plastic work inside your aquarium. Blades full of sharp ideas. 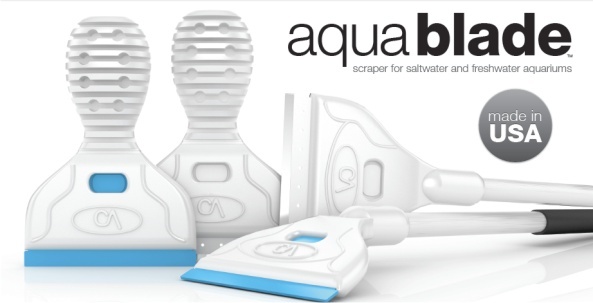 The AquaBlade cyan blade was created by testing countless different types of plastics and plastic blends. The results are a special self lubricating plastic that is softer than acrylic, so it will not scratch acrylic. Constructed of 316 stainless steel, the AquaBlade metal blade is both strong and rust resistant so removing that stubborn coralline algae is a breeze. White plastic works inside your aquarium. Allows you to see the scraper more easily through darker algae. This means you dont miss any spots the first time around the aquarium.